The change in seasons is coming, and that means dry air, colds and flu, and any number of health issues that can be addressed by having the correct humidifier in your home. Humidifiers are great. They are simple, effective and have become a staple in many households. Once upon a time, the gold standard was a warm mist model that was plugged in to treat cold symptoms. But now, there are both warm and cool mist types, and even those that can change between both. Let’s look at the basics of each type of humidifier operation. 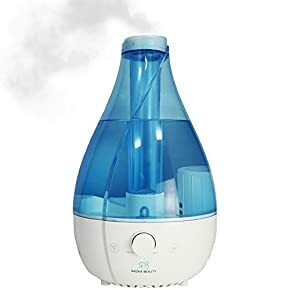 By definition, a humidifier adds moisture to the air. The amount of moisture in the air is measured by a humidity level that is a percentage. Since most of us don’t really pay attention to our home’s humidity levels, you might not be aware of what the healthy range is for all of us. For maximum benefit to your sinuses, respiratory system, and skin, you’ll want the humidity levels to be around 35-45%. Common times to break out the humidifier are when someone has a cough, stuffy nose or during allergy season. 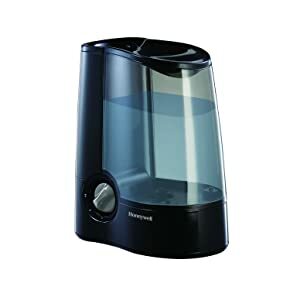 Cool mist humidifiers operate by using ultrasonic technology. A disc in the water reservoir vibrates at ultrasonic speed. This breaks the water into tiny droplets, and they are released into the room air. They are quiet and efficient, and don’t use any heat. They are best for situations that require the utmost attention to safety, as they never heat the water up. They are best for children. They have some drawbacks, such as problems with hard water and bacteria. It’s important to clean cool mist humidifiers daily to prevent mineral build-up and bacterial growth. Running time: How long will the unit work before it needs to be refilled? 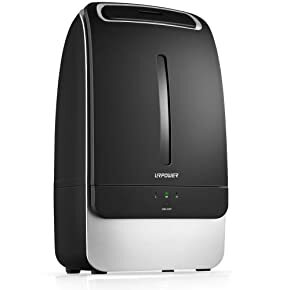 Easy of cleaning: How easy is the unit to keep clean sanitized? Extra features: We will evaluate extra features like night lights and timers. 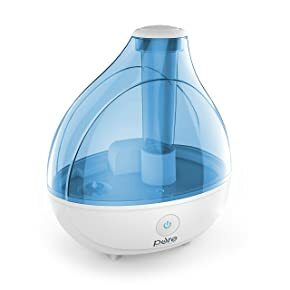 Here are some of the best cool mist humidifiers on the market. 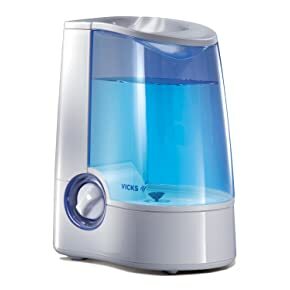 Vicks has been a leader in making humidifiers for years now. It’s quite possible that you grew up with one. This is a well-balanced unit that is our top choice for cool mist humidifiers. It holds 1.2 gallons and has an impressive 30 hour run time. The output can be controlled by a variable controller, which is helpful in smaller rooms. The unit is easy to clean, and most people should be able to fit their hand inside the tank to clean it without a brush. A nice feature is the scent pads that can be added in the special slot. These can be purchased separately and will last up to 8 hours as they disperse scents like eucalyptus and menthol into the mist. It has an auto shut-off feature, and works quietly and effectively for rooms up to 400 ft. Measurements are 11x9x15”. Tiny home living is a real thing these days, and the MistAire is perfect for the pared-down lifestyle. It has a tiny footprint of just 11x9x7”, and can fit easily into your compact lifestyle in an RV, tiny house, or similar small space. It holds 1.5 liters, and gives about 15 hours of running time per tank. It works best in spaces under 300 sf or so. Under these conditions, it does very well. It’s quiet, has a 360 degree adjustable nozzle and also has a nightlight that will light your way in your small space. It comes with a cleaning brush (which helps, since it is rather small) and does not use a filter. Some users have mentioned that the unit can spill water into the fan exhaust easily. This is one of the pricier units in this group, especially for its size. This unit has an impressive 6 liter capacity and the longest running time of any of those reviewed in this category. It can cover a larger room – reviewers note that spaces up to 20×20” can benefit from the output the Everlasting Comfort machine puts out. It may not quite be a “fill it and forget” machine, but the fact that it can go for up to 60 hours without a refill is pretty amazing. It has an auto shut-off for when the tank does go dry. It measures in at 14x12x8, and comes in white. An optional LED nightlight feature provides a blue light if desired. This machine also has an essential oils tray that will allow the oils to be diffused into the mist, adding fragrance to the air, if desired. The size of this unit pretty much guarantees that you’ll need to place it on the floor. Unit can spill condensed water when it’s being picked up for cleaning. 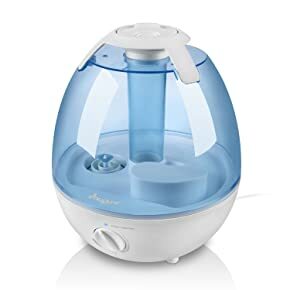 This PurSteam humidifier is a great personal size for use in a small bedroom or even at your work desk. It’s small and efficient for these types of spaces. It holds 2.2 liters, and runs for up to 17 hours per tank. There’s an auto-shut off feature for the forgetful. This model has a nice bright nightlight function. It’s sleek and small at only 10x10x8”- perfect for stashing on a nightstand. There’s no filter to worry about, and it is light and easy to refill. Both the spray direction and output are adjustable – nice in tight spaces where you don’t want moisture to build up. Some users have noted problems with the unit malfunctioning and needing replacement. Some buyers noted that the tank is awkward to lift and carry for refills and cleaning. The Urpower unit is an efficient model with an adjustable output and a sleek look for minimalist households. It holds 5 liters and will run quietly for 14-17 hours. This will be affected by the output dial. Reviewers say that this is a simple, quiet workhorse. It doesn’t have a lot of bells, whistles and lights, but it does its job well. It measures 16x10x8” and is probably a little large for most nightstands, but can be tucked away pretty easily, since it’s fairly shallow in depth. It has an easy one-button operation for on/off. No refilling from the top – the whole cover must be removed. No light, no essential oil tray, no timer. If you’re committed to keeping a smaller space on the healthy side of the humidity scale, then the Crane humidifier will be a nice choice. It holds one gallon of water and can run quietly for up to 24 hours without overwhelming the room with too much humidity. The design is a tidy little teardrop shape that would look cute just about anywhere. It has a small footprint and is only 9 inches wide. At the top of the teardrop is an easily adjustable nozzle that allows you to direct the mist. It has an automatic shut off and reviewers find it to be quiet and unobtrusive in their small rooms. This Anypro unit will work just great in a child’s room, with its special features. The silver composite material used is helpful in reducing mold growth, when used with distilled water. It runs quietly for a range of 20-36 hours, depending on the level of the mist output selected. The reservoir holds 3.5 liters. For night-time use, the kids will love the special colored LED lights. They can select from a range of colors – purple, yellow, and pink are just a few. The design is specifically to help prevent any leaking from condensation, and reviewers report few problems with drips. The mist output can also be directed in any direction with the 360 degree nozzle. The unit is a fairly compact 9x10x9”. Some people find the LED lights to be too bright and distracting in a dark room. Some reviewers find the unit hard to clean, even with the brush that is included. This is another good all-around unit that earned a First Runner-Up rating from us in our cool mist category. The Aennon has a 20 hour running time with a 2.8 liter reservoir. Reviewers find it to be quiet, trouble-free and love the colored lights. This unit has an essential oil tray so you can also use it to disperse essential oils into the air. It has an adjustable 360 degree nozzle output for the mist, which can be adjusted for volume. The LED lights are a nice feature that reviewers enjoy. One can choose from 7 different colors, or simply let the unit cycle through all of them on its own. It comes with a cleaning brush, two scent sachets, and a stone filter that is intended to help with keeping the water in the unit clean. Users say that it can cover a fairly large area with scent and adequate humidity. Some users feel that the mist output could be adjusted more – the current settings put out too much. Some reviewers find the LED lights to be too bright. Warm mist humidifiers work in a different way than cool mist units, and that difference is why some prefer them. In a unit like this, water is heated to boiling temperature in the reservoir, and this creates the warm vapor. 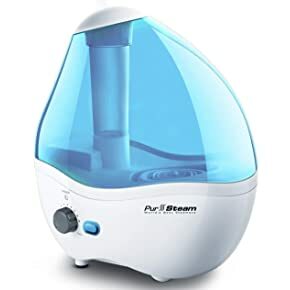 In steam humidifiers, (aka: “vaporizers”) water is heated to boiling temperature in the reservoir, and the resulting vapor is pushed out into the air by a fan. These units can be used with oils like menthol or eucalyptus to help with stuffy noses and congestion. 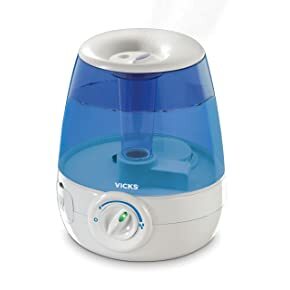 Vicks wins again with their vaporizers. 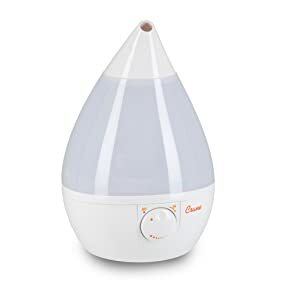 This unit has everything you love about warm mist humidifiers: Medicine cup to add oils, hot steam to cut down on bacteria, and quiet operation. It also has a good sized reservoir. This unit holds 1 gallon of water and can run up to 24 hours on a low setting. Reviewers say it’s easy to clean – the clear plastic has a wide opening and you can easily see any spots that need extra attention. This is a larger unit – measurements are 12x8x14”. However, it covers a good-sized room, and does it efficiently. Users can add any of the popular inhalants to the medicine cup on top of the unit. Like all units, this will need to be used with distilled water, or cleaned regularly. Unlike ultrasonic units, the minerals will be left behind. Uses more power than some other units. The Honeywell HWM705B was popular with buyers because of its simple operation and easy controls. Sometimes, there’s a lot to be said for a machine that just does its job and doesn’t need a video to show how to operate it. This unit holds a gallon in the reservoir, and can run up to 24 hours. The controls are simple – you have two output settings – high and low – and a power button. When the reservoir is dry, it shuts off. This is an easy unit for even nearsighted folks to operate. It works well in rooms that are up to medium size, has a medication cup for inhalant therapy, and is easy to clean. Reviewers rate these as a reliable unit that will last well, as long as the user keeps it clean. Some reviewers find the medication cup hard to clean. The Holmes HWM 6008 won reviewer love because of its easy cleaning capabilities. The primary plastic parts have been made with anti-microbial plastic to cut down on bacteria, and the bottom tray can be washed in your dishwasher. The reservoir holds 1.7 gallons and can run up to 24 hours on the low setting. It performs well in smaller rooms. The medicine cup is located on the top of the machine and can be used with all sorts of inhalant treatments. There are two speeds and users report that this runs quietly all night. The size is 14x7x14”. Some reviewers have had problems with overheating. This is one of the more expensive units. If you can’t decide between the cool mist humidifiers and the warm mist versions, there’s good news. Some units will let you pick between both! 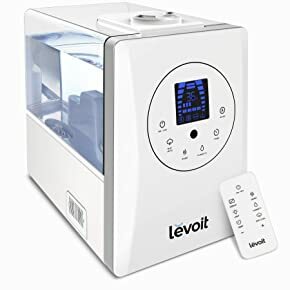 Levoit has come out with a humidifier design that is sleek and efficient. It may not be what you think a humidifier should look like, but it does everything very well. This machine holds 1.5 gallons and is designed to handle larger rooms with no problems. Running time is 20-36 hours. The tank is clear and the simple dial at the top allows one to switch from warm to cool mist. Reviewers find the functions to be quite effective. There is a humidity sensor that allows the machine to adjust itself to maintain the desired setting. It even has a remote control. The ABS plastic tank is easy to carry, clean and fill. The PTC heater system kills most bacteria, for clean humidification of your home. The unit also comes with an aroma pad holder for use of essential oils. Cannot be placed on wooden furniture. TaoTronics has come out with a unit that works well and combines a lot of features in a plain black wrapper. 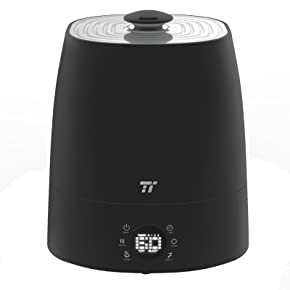 This humidifier has some helpful feedback functions, holds a whopping 5.5 liters of water, and lets you switch to warm mist when you need to get the air humidified faster. It will operate quietly for up to 40 hours on the lowest setting. Furthermore, it helps the user by monitoring the humidity level, turning itself off when the desired percentage is reached. 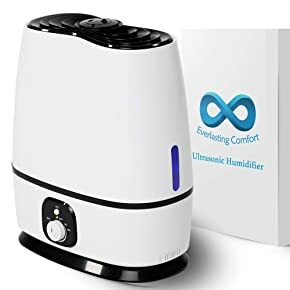 Other helpful features are a timer and the ability to set the unit on sleep mode – this keeps the humidity at a constant level, and the machine unable to beep during the night. Reviewers find it to be quiet and unobtrusive. It measures 9x8x12” and comes in a sleek black case. Other features include a removable filter and cleaning brush. The Radha unit is an attractive machine that does a lot. It combines several features that are popular in other machines, and has an attractive price point. The Sea Jewel lets the user decide between warm or cool mist with a click. It also has a tray for essential oils, and has very quiet operation that can humidify a medium sized room. In addition to the efficient operation, this machine also has an LED light function that allows one to choose between 7 different colors. The reservoir holds 3.7 liters, and gives up to 8 hours of run time. The unit size is 8x8x13”, and the machine itself is blue. It comes with two cleaning brushes. Some reviewers find it hard to clean. Some purchasers have had problems with units arriving and not producing the warm steam. The company customer service seems to be excellent, though. 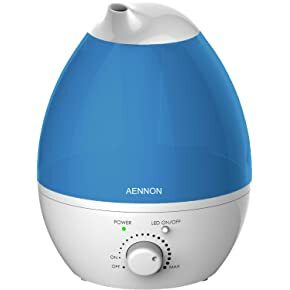 Selecting the best humidifier for your home should be based on the size of your home, your need for the use of inhalants or essential oils, and the desirability of features like nightlights, easy cleaning, and humidity sensors. 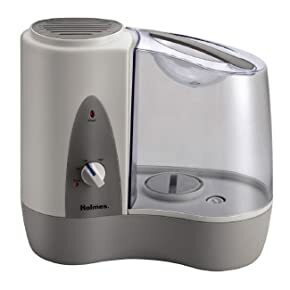 No matter what your choice, be sure to keep your humidifier clean and make sure that mold or mineral deposits don’t occur. With regular maintenance, even the cheaper humidifiers will last longer and perform at their best.